Glenys decided that there are too many young children being left alone in a South African township. 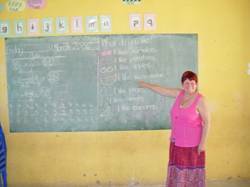 To help educate them and increase their safety, she started a school under a tree on an empty lot. Under a tree she taught 18 children to read and write English. She also taught crafts and sewing so they could earn money. Today she has a 600-student, six-building school with a play ground, a vegetable garden, and a water well pumped by the merry-go-round play equipment. 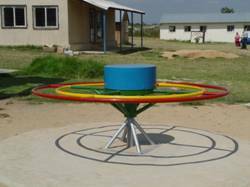 When the children spin this merry-go-round, a water tank above fills with water. As a result, flush toilets are in the school, the only ones for miles! Glenys rescues prostitutes (10-years old and younger) and teaches them how to make clothes, jewelry, placemats, table cloths, and other crafts in her home. 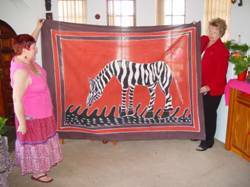 This table cloth was created by two 13-year-old girls Glenys rescued from the streets. She teaches girls how to make a living by selling their art.